Los Angeles as viewed from Mulholland Drive, February 2009. From street level, Los Angeles often seems like an endless tangle of concrete; a horrific urban sprawl worthy of being the backdrop to a cyberpunk novel. Certainly, there are parts of it that are beautiful, but these places are for wealthy or long-established households. For most, the Westside’s postwar neighborhoods–with their sprawling ficus trees and lush gardens–are unaffordable. And the further east you drive, the more L.A. seems like a suffocating expanse of pink stucco, broken sidewalks, and polluted sky. It offends the Midwestern eye. It seems claustrophobic, labyrinthine, terrifying. Stuck in traffic on La Brea, you start to question your sanity, and consider moving to Alaska to live with wolves. And then it rains, and everything changes. 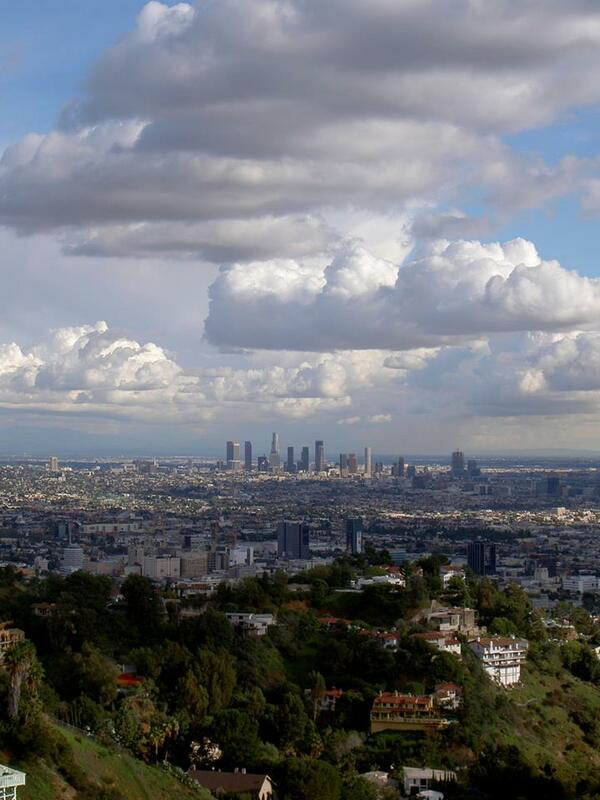 After the rain, Los Angeles comes alive. You can see ten, twenty, thirty miles. The Hollywood sign is legible from Hermosa Beach, and in the distance are snow-capped mountains. The pink stucco glows like a healthy complexion, the concrete’s glow lightens the shadows, and everyone seems just a little bit kinder, a little bit more genuine. It is almost as if the rain washes not just the city, but the entire Angelino psyche. Suddenly, we, the manufacturers of delicious lies, become a bit more honest. And it is delightful. In the midst of the city, the effect is lovely. Viewed from a distance, it is breathtaking. Los Angeles becomes a jewel, nestled within an expanse of green velvet, held in a box of sandstone and shining water. It is something that you will want to collect, observe, treasure. The beauty will overwhelm you. You will want to take pictures; you will take pictures, but they will never quite do the day justice. For no photo can capture the damp breeze carrying petrichor, the sounds of children playing happily, or the magnificent vastness of the city that is revealed when the smog is washed away. But these photos will become synecdochic tools to remind you of the truth of the city: it is not ugly, it is not dead, it is not fearful. Los Angeles is alive and beautiful. But like a human being, you sometimes have to look a bit deeper–or wait for the perfect moment–to see it for what it really is.